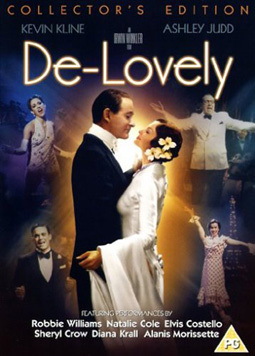 De-Lovely, a biopic about the life of legendary composer/lyricist Cole Porter, played by Kevin Kline, recreates the extravagant style of the classic MGM musical, set to Porter's music. The film also features contemporary artists such as Sheryl Crow, Natalie Cole and Alanis Morrisette, who make cameo appearances, with up-dated versions of Porter's songs. John plays one of Porter's young lovers, Jack, a rising theatre star, who memorably duets with Porter in a show-stopping performance of "Night and Day".